On April 10, 2019, New Jersey‘s governor, Phil Murphy, announced new Transit Village grants totaling $1 million to help create transit-oriented revitalization in five municipalities. The grants are designed to advance Transit Village projects that will improve quality of life without burdening local property tax payers. Municipalities included: Bloomfield (Essex County), Morristown (Morris County), Somerville (Somerset County), Hackensack (Bergen County), and West Windsor (Mercer County). Under this multi-agency smart growth initiative, municipalities that have transit facilities within their borders can seek to be designated as a Transit Village by developing plans for dense, mixed-use redevelopment that includes housing near their transit facility. The initiative creates incentives to revitalize areas around transit stations to create attractive, vibrant, pedestrian-friendly neighborhoods where people can live, shop, work and play without relying on automobiles. Each municipality with a Transit Village designation may submit one application for funding. Applications must be for projects located within one-half mile of the transit facility and the projects are awarded on a competitive basis taking into consideration proximity to a transit facility, walkability, bicycling, project need and applicant’s past performance using other Local Aid funds. The Transit Village Program seeks to reduce traffic congestion and improve air quality by increasing transit ridership. Studies have shown that adding residential housing options within walking distance of a transit facility; typically a one-half mile radius, increases transit ridership more than any other type of development. Therefore, one of the goals of the Transit Village Initiative is to bring more housing, businesses and people into the neighborhoods around transit stations. Featured photo by ZeWrestler (via en.wikipedia) shows the War of the Worlds monument Grover’s Mill, New Jersey. 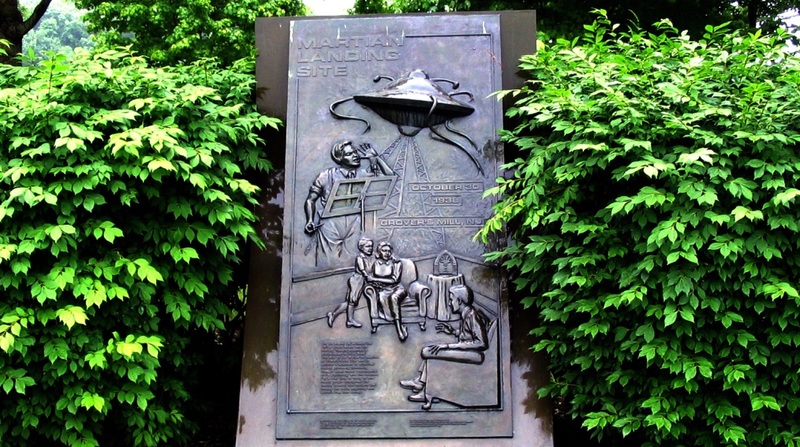 The landing site marked by the monument is the current day Van Nest Park in West Windsor Township, New Jersey. Learn more about New Jersey’s Transit Village initiative.